A year ago, we had an instinct that there was lots of ‘youth voice’ work happening across the country, but a comprehensive picture of what was actually happening didn’t exist. A year later, after a period of Youth Music-funded research, we have a clearer, more factual picture of music projects that empower young people, provide them space to take the lead, and give opportunities for young people to have a voice. We have discovered inspiring examples of best practice and approaches. We also understand more about the support and guidance organisations are looking for to find new and improved ways to empower young people. The first phase of findings from Re:Wired is now live online. On the Re:Wired site you will find highlights from the research survey summary; an interactive national map showing the different types of activity happening in many regions of England; and key reading on the topic of youth voice and leadership. Over the coming months, further case studies and resources will be added, so watch this space for more tools to help you reflect upon and develop youth voice, leadership and empowerment in your organisation. 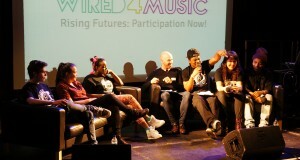 As we reflect upon Re:Wired, we’ll also be thinking more about how we might move towards a national youth voice in music.